Fusion power technology is mankind's biggest engineering challenge. Leading scientists, engineers and planners are working towards the solution significantly aided by the availability of 3D model based data held within a single software environment. Nick Lerner reports. 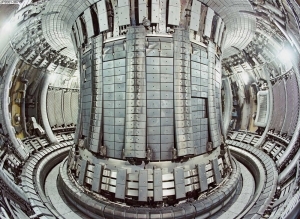 Located at Culham, UK, JET (Joint European Torus) is an experimental fusion energy device in which, by creating temperatures greater than that of the sun (around 100 million°C) and applying magnetic confinement, fusion of atomic nuclei takes place. The next stage of fusion technology development has started with the building of ITER, which is eight times larger in volume than JET. ITER is one of the most challenging scientific experiments ever undertaken, leading initially to a trial generating station followed by full-scale generators, supplying fusion energy to the grid by the end of this century. 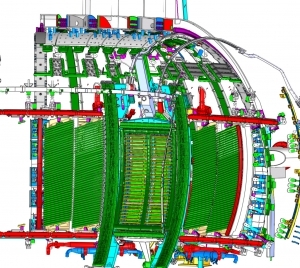 The business benefits that Dassault Systèmes methodology delivers to the ITER supply chain derive from using 3D model technology to develop and communicate information. Some of the most complex elements of JET are the remote handling systems. These emulate human movement controlled from remote stations several hundred meters away and are developed by JET operator UKAEA in conjunction with Oxford Technologies staff. Simon Mills, Oxford Technologies' Engineering Director explained the system's operation. "A force reflecting master manipulator transmits a human operator's motions and forces to a remote slave manipulator inside the tokamak* chamber. The system performs maintenance tasks without the need for engineers to enter the hostile tokamak environment. Some 20000 tasks have been performed at JET over the last 12 years. These include installing components, changing configurations and updating systems inside the tokamak. Maintenance and enhancement periods occur at intervals of 3-4 years and may last from a few months to more than a year. Between these 'engineering breaks', the remote handling systems are used to develop techniques for performing future maintenance tasks." Once ITER is operational, there will be no human access to the tokamak or other areas of the plant containing highly active systems. All maintenance and future upgrades will then be carried out remotely. 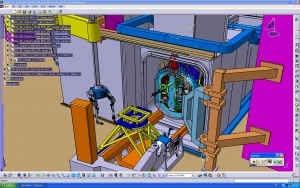 All companies in the ITER and JET engineering supply chains use CATIA, DELMIA, 3DVIA Composer and other Dassault Systèmes PLM software and methodology. One company that is involved with both JET and ITER technology provision is Oxford based, Desktop Engineering (DTE). Managing director Geoff Haines talked about the company's role. "JET and ITER bring together many engineering and scientific specialists who need to communicate and operate in a concurrent and collaborative way. DTE provides design to manufacture PLM software and support services to companies involved with both the buildings and structures as well as the systems that they house." Simon Mills added: "DTE helps us to derive maximum engineering and commercial advantage from our Dassault Systèmes technology with ongoing training and support. They have introduced us to the newest methodologies which save time and money by increasing productivity and overall efficiency. "One example of this was the introduction, by Desktop Engineering, to Oxford Technologies, of 3DVIA Composer to animate CATIA generated 3D imagery. This not only allows them to refine their designs through the better cognition that kinetics enables, but also gives all stakeholders a clear understanding of the equipment in its context and detail." Communication in 3D is the norm since the deployment of 3DVIA Composer allows non-CATIA users visual access and interaction with 3D digital models of Oxford Technologies' remote handling systems. Geoff Haines commented: "The production efficiencies derived from specifying Dassault Systèmes technology throughout JET and ITER supply chains are augmented by the introduction of 3DVIA Composer. It provides simple access to 3D data and lets people understand how complex systems operate and interact." Oxford Technologies' contribution to JET and ITER relies on the ability to develop and integrate innovative engineering solutions. These must operate reliably in the harsh yet delicate environment of the tokamak. Simon Mills concluded: "Devising articulated boom type devices, and ancillary components, to operate within the tokamak at maximum efficiency, safety, precision and speed, requires an engineering design platform that allows our full creativity and ingenuity to flourish. It also needs a technology partner, in this case Desktop Engineering DTE, to work with us and introduce and support economical, scaleable and fully compatible software." Geoff Haines added: "The results of today's fusion engineering will secure the world's energy future. Its PLM foundation is optimised to assure future-proof scientific, engineering and commercial success for the project and the enterprises that it comprises." * tokamak: a toroidal apparatus for producing controlled fusion reactions in hot plasma.